In 2013 the Lotte Lehmann League renewed the award. It was offered to Kammersängerin Christa Ludwig and accepted. It was sent to her, and you can view a copy of it here. Composer Richard Hundley accepted the Award in 2014. Scroll down this page to see the Award as well as photos from the presentation. To acknowledge the many areas of art song served, a special World of Song award was presented on 1 December 2014 to Paul Sperry. 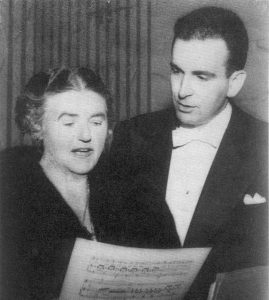 Composer Tom Cipullo arranged that it be presented by Louise Basbas, the president of the Bohemians Music Society at a concert jointly sponsored by them and Paul Sperry’s own Joy in Singing. You can view Denis Lund’s beautiful document at the bottom of this page. 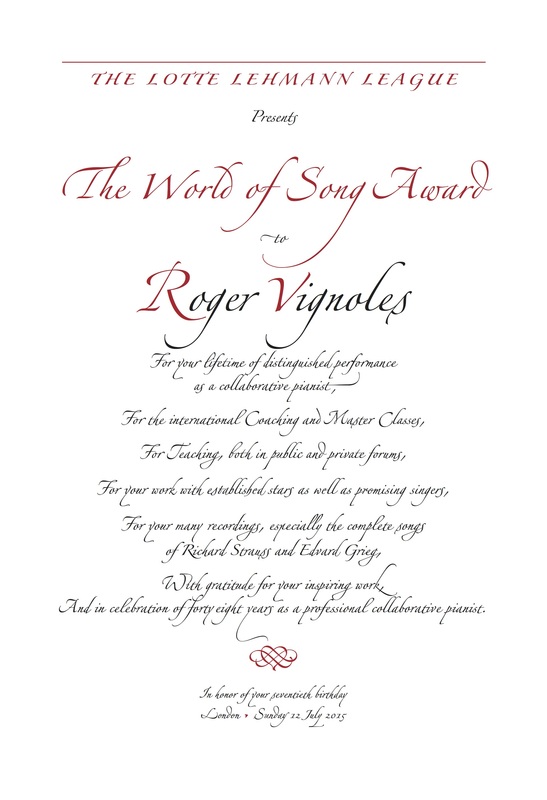 In 2015 we had the first-ever tie vote for the collaborative pianist, so we presented both Roger Vingoles and Irwin Gage with the World of Song award. Scroll down to see these beautiful presentations. 2016 has seen the board demonstrate their support for Elly Ameling, who made it her career to perform and record art song. 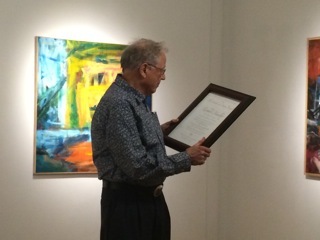 The calligrapher, Denis Lund, has been contacted and the Dutch contralto, Gerdine Markus, who lives in Hilo, on the Big Island of Hawaii presented Ms. Ameling the award. You can see the award and ready Ms. Ameling’s enthusiastic response, below. Auger. 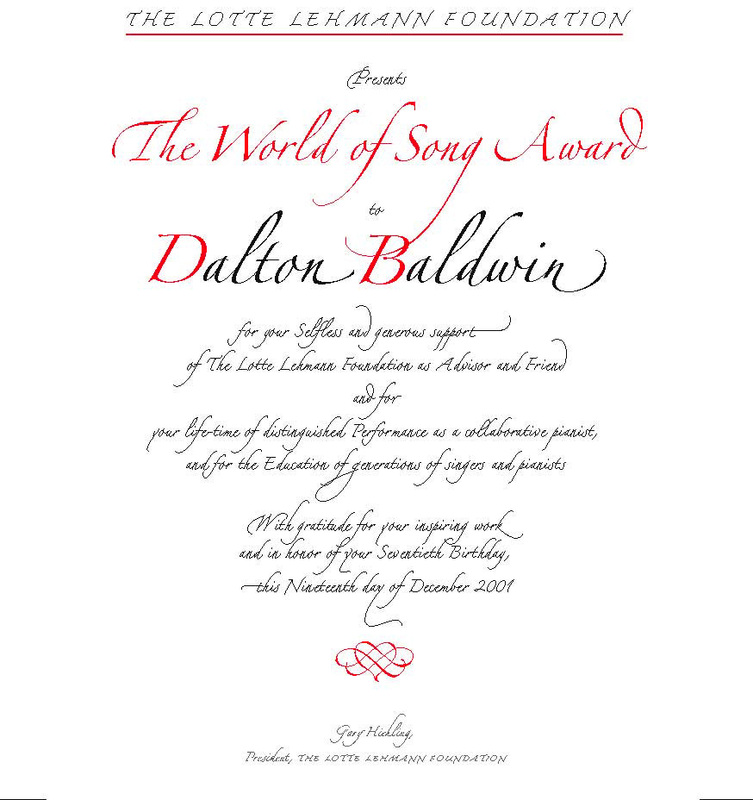 Presently teaching at Westminster Choir College in Princeton, New Jersey, Mr. Baldwin finds time to travel around the world teaching art song master classes. He knew Lehmann personally and visited Lehmann’s home in Santa Barbara, California, with Souzay. On 19 December 2001 Mr. Baldwin celebrated his 70th birthday with a grand, musical party in New York City. 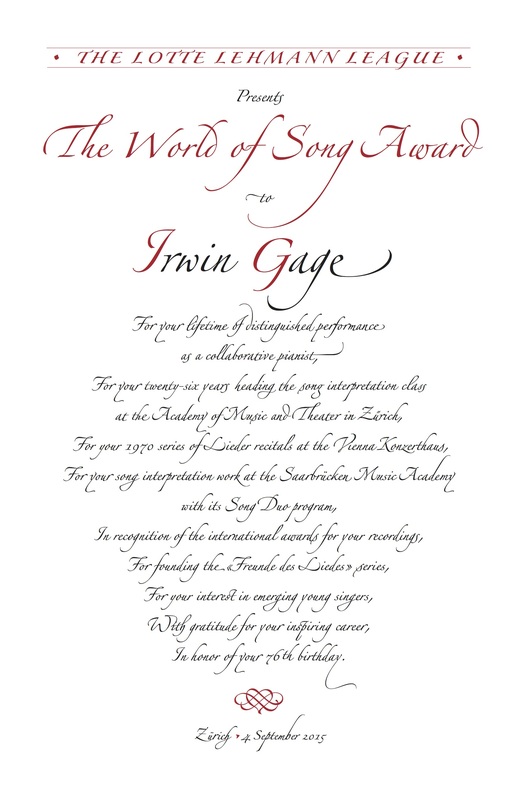 The Lotte Lehmann Foundation presented him with its first annual World of Song Award. Sadly we don’t have a photo of Baldwin with Lehmann, but we do have this one with Souzay. 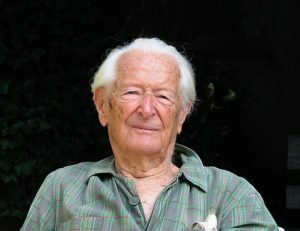 In an interview in 1997, 95-year-old Swiss Cuénod talked to pianist Graham Johnson, recalling prewar Vienna and Paris, where he frequented aristocratic salons and worked with Nadia Boulanger. After the war, the new early-music boom relied heavily on his light, unmannered, natural sound, and Cuénod made several pioneering LPs — his 1950 recording of Couperin’s Lamentations prompted Stravinsky to ask him to sing in the premiere of The Rake’s Progress. Opera has been a constant thread, but at the heart of Cuénod’s repertoire is French song — he knew and worked with Honegger, Auric, Roussel, Poulenc, and others. This photo below was taken by tenor Robert White in 2004 when Cuénod was 102. 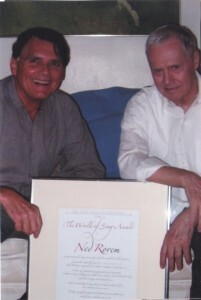 In 2003, on his 80th birthday, the Award was presented by Gary Hickling to the Pulitzer Prize-winning American composer, author and collaborative pianist, Ned Rorem. The man who Time Magazine called “the world’s best composer of art songs,” possesses a special genius for prosody and melodic beauty. One can view the award here. 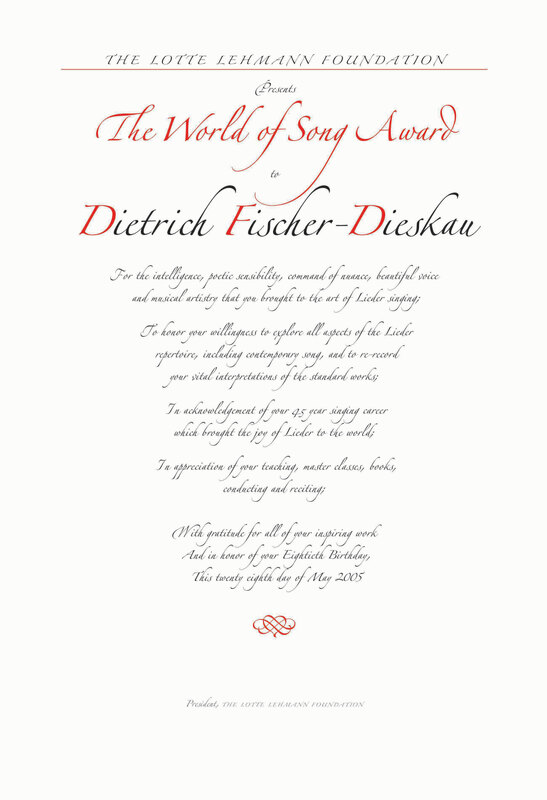 The Lotte Lehmann League is proud to announce the recipient of the World of Song Award for 2014. 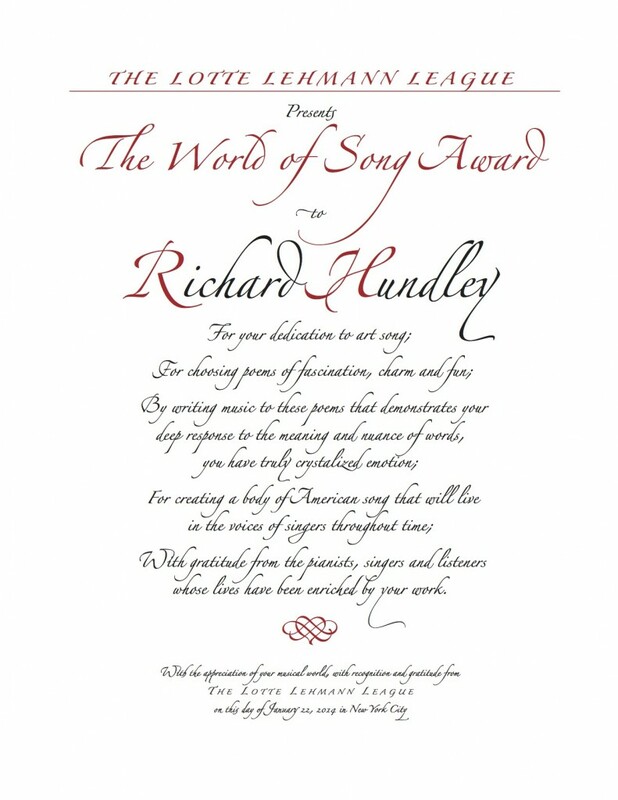 It is the American composer (mostly of art song) Richard Hundley. 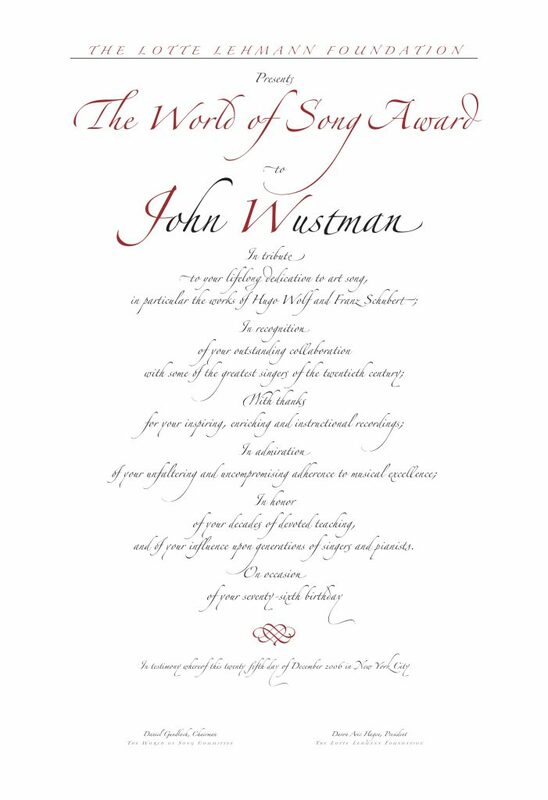 Once again, calligrapher Denis Lund has created a masterful work. Many thanks to him. Also, thanks to Paul Sperry for coordinating and presenting the Award. It was scheduled to be presented in January 2014, but Mr. Hundley had a fall and was hospitalized. He received the Award in March. 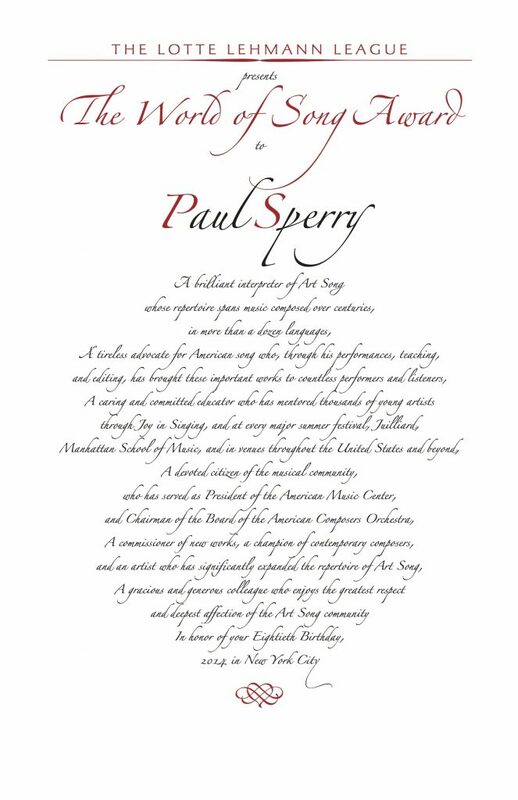 2014 Paul Sperry has done so much for art song, his World of Song award was hardly long enough to contain everything. 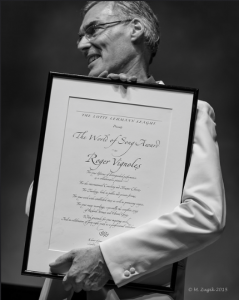 I join the rest of the music community in thanking him for his service to art song. Here is Mr. Sperry’s response: “To say I was surprised is an understatement. When Louise Basbas said she wanted to honor me, I said, ‘what am I being honored for?’ I was absolutely bowled over. Someone said it reads like something you say before giving someone an honorary doctorate. I’m so touched and so pleased and so I thank you very much for thinking of me for this. I hope I continue to deserve it”. 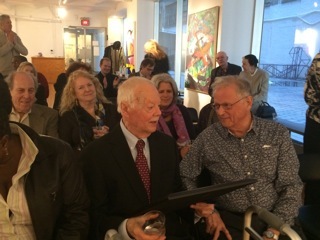 Paul Sperry receives the award. 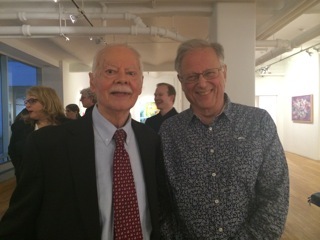 Both wonderful, highly praised pianists, who have enriched the world of art song for decades. The votes of the board came in an exact tie. That has never happened before, so we honored both. Here’s what Ms. Ameling wrote upon learning that she had received the award. 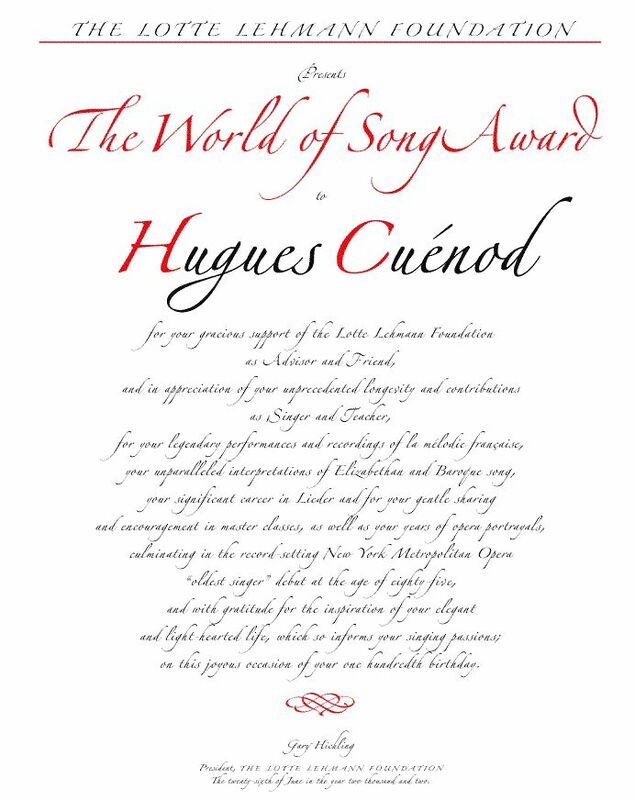 May I thank you and the members of the board of the Lotte Lehmann League from the bottom of my heart for the honor that you plan to bestow on me, namely selecting me for the 2016 World of Song Award. In a time when the real awareness of what Art Song is and how it should be performed seems at risk to become rather vague, I feel deep gratitude to the Lotte Lehmann League for their efforts to keep this very special and delightful kind of music in full view of the public attention. I am looking forward with great joy to receive the beautiful award any time at your convenience. I thank you once again very warmly. Upon receiving the award, here is what Ms. Ameling wrote. Thank you very, very much for the most beautiful Award, that was handed over to me by dear Gerdine in the Concertgebouw in Amsterdam, under my bronze portrait, and in presence of the director of the Concertgebouw. Today this honor was reported on the Classical Radio Program accompanied by a recording of my singing with Rudolf Jansen at the piano of Debussy’s Beau Soir. Well, yesterday was a “beau après-midi” (in not quite right French…) with a nice gathering in a neighboring restaurant with other musicians such as Daniel Wayenberg, the pianist, and Jaap van Zweden, who is the next conductor of the NY Philharmonic, as you may know. 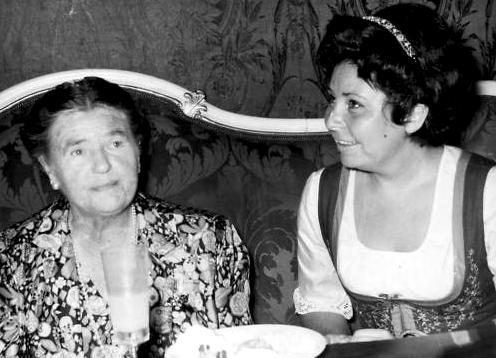 I hope that you will be able to continue your indispensible work for the Lotte Lehmann League for many years to come. With the help of a neighbor (because I am not quite able to ‘unlock’ the secrets of the internet) I shall soon read your books and all the various information on this great singer, as I find it indicated in the internet. Stay well and be blessed, dear Mr.Hickling.